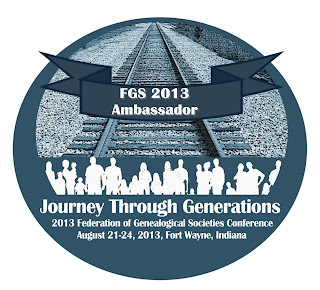 I recently received—and accepted—an invitation to become a Federation of Genealogical Societies (FGS) 2013 Conference Ambassador. Even though the FGS Conference isn’t until August 21-24, I’m already starting to get excited about it. For one thing, I can’t wait to get back to Ft. Wayne and do some more research at the Allen County Public Library. The last time I was there, I found some really good stuff just as I was leaving (isn’t that always the way? ), and I want to follow up with it. For another, the line-up of speakers and activities at the conference looks fantastic. But one of the biggest elements that makes a genealogy conference fun is the people there. So I want all my friends and readers to come (well, it makes sense to me!). If you haven’t taken a look at the schedule yet, why not head over to the FGS Conference website and browse around? As my first semi-official act as an Ambassador, I’d like to make a recommendation: sign up to get posts from the FGS Conference News Blog. You can subscribe to it either through email or an RSS reader (if you’re not familiar with RSS, just choose the email option). The blog provides a wealth of information on conference speakers, programs, and events, and gives tips for researching in Ft. Wayne and other nearby areas. It gives practical advice for visiting Ft. Wayne and getting the most out of your conference experience. And it shows the level of excitement that’s already building for the event. After you’ve read a few posts, I think you’ll see why I think the FGS Conference is going to be the place for genealogists to be in August. Will I see you there? Thank you, Shelley! I'm going to put the FGS Conference News Blog on my Feedly. I've signed up for the conference. I want to see the DNA presentations on Thursday, and the African-American and slave research related presentations on Friday. And I want to meet the people that I've been tweeting with, and exchanging blogs with! However! My daughter, who lives in Fort Wayne, is expecting a baby (our first grandchild) in mid to late August. She lives a few miles away from the conference center. I guess I'm thinking there's a definite chance she won't have the baby until after the conference . . . but if she gives birth during the conf., my husband and I will be right there available for her if she needs us. And of course, if the baby arrives before the conference, daughter and granddaughter are our first priority. A dilemma of ethics and family logistics. We just hope the baby arrives with no complications and everyone is healthy. For the rest, we'll figure it out. I'm excited that I'll be able to meet you at FGS, Mariann! It will be great to talk with you in person after getting to "know" you through our blogs. That's one of the neatest things about conferences, I think. Best wishes to your daughter as she prepares for her baby. Naturally she is your first priority. Hopefully everything will go smoothly and you will have many reasons to celebrate in Ft. Wayne! I feel my resolve weakening...it would be fun to hang out with an official Ambassador! It would be great to have you there, Malissa! Hoping. Keeping fingers crossed that the stars will align and I can make it!